Dropbox, the popular cloud file-sharing and back-up tool, is on a tear with 25 million users using the system and 200 million files saved each day, according to new data from the company. That’s a huge increase for Dropbox, which reported 4 million users in January of last year and 1 million in April 2009. But it’s just the beginning. The company sees a bright future providing syncing services as more devices become connected and more services tie into Dropbox. While the service started largely on desktop and laptops, it has grown mightily in the last year with the popularity of smartphones and tablets. Next up, it will be TVs, cameras and even automobiles, said Drew Houston, CEO and co-founder of Dropbox. Houston said he’s hearing from “countless companies” looking to build Dropbox into their products. The idea is that users will be able to view their personal photos on a TV or play their own synced music on a car via Dropbox. Houston said in the near future, consumers will see an array of products in Best Buy (s bby) and other stores offering the ability to sync with Dropbox. “There’s never been something like Dropbox to tie all these things together. So one of the big things we’ll be doing over the next couple years will be building these kinds of seamless experiences with leading partners and putting them in tens and soon hundreds of millions of people’s hands,” Houston said. The push from 25 million users to 2.5 billion users, Houston’s lofty goal, will clearly take some time. But the team at the San Francisco-based company has shown they’re focused on building a solid product with proven reliability, even with a crush of new users. That influx of users is a big reason why usage has soared to 200 million files saved a day. For perspective, that’s more files saved than there are tweets posted on Twitter each day. Dropbox has managed to grow without advertising because it has great word of mouth. That has extended overseas, where the company now sees half of its usage. It sells in 175 countries, which is pretty remarkable for a company that has only put out an English version until today. The company just announced German, French, Spanish and Japanese support for the first time. Co-founder Arash Ferdowsi said Dropbox will be putting even more emphasis on its platform this year, and will be looking to get it integrated with more apps and services. There are more than 200 apps that currently hook into Dropbox and Ferdowsi said there are many more opportunities to make the service ubiquitous as it scales up. He said the company is working on its APIs to make it easier to access and pull content from Dropbox. If all goes well, many sites will give users the ability to back up their content directly to Dropbox, something we’re already seeing with many productivity apps. Houston and Ferdowsi are quiet on their next funding move. They said even with the explosion of users, the business model of offering 2 GB of free storage for users while upselling a fraction on premium services is holding up. The company, a former Y Combinator start-up, previously raised $7.25 million in a Series A round from Sequoia Capital and Accel Partners. It will likely need another big chunk in the near future, because the company has very big plans. I sure hope Dropbox will remain on top for at least the next 12 months cos I’ve just paid for 12 months of 100GB Pro user storage :P.
Better integration with mobile is also something that will take them to the next level. Access to information from anywhere…almost scary. Yet, appealing. The real threat to DropBox will be from Amazon. I am sure some product is being cooked that would be more palatable to the end user. That would be similar to Google releasing Google Calendar that killed kiko. Not the same, but similar. I use the hell out of their service now and see potential for it to move well beyond what it is now. I love the fact that I can hit save, close the lid on my laptop and resume editing at my work desktop as if it was the same computer. 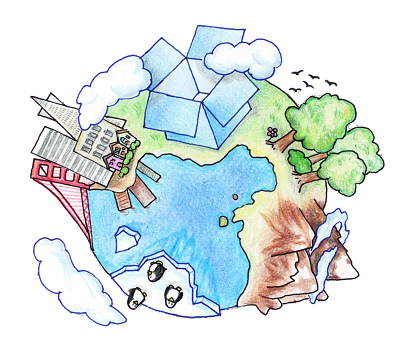 Dropbox is easy to use, but for corporate use, its storage is expensive and a bit slow. Google Docs is better for business. Use it with Syncdocs http://www.syncdocs.com to turn Google Docs into a shared folder box like dropbox. Chump at 2GB is right, but the trick is the free marketing. Refer friends and turn that 2GB to 10GB. (Use this link and get an extra 250MB on your free account and mine ;) http://db.tt/uxu1iSm). So their real secret sauce is that get those people that never buy anything to market for them for free. Dropbox has become my standard method for transferring extra music and videos for to iphone. The data is handy but not burning up my limited mobile storage. They are definitely right to be bullish because they have a business model, which is holding so far. However I heard the security is not necessarily there. Plus, they now have competition, such as http://www.box.net. The future looks bright because they know 2GB is chump storage today and getting chumper every day, so the upsell potential only increases. This isn’t a criticism, just a realistic assessment of why they should be bullish.